Can you believe we've had 100 days of school so far this year? Time flies when you're learning and having fun! Schools across the district celebrated the milestone with special parties yesterday. See more photos on Facebook. Over the past couple weeks, a few district citizens, unhappy over the closing of schools or, perhaps, because recent elections did not turn out as they wished, have taken their unhappiness out on Kristen Hoheisel, District 834ʼs director of finance. They have expressed their anger through various media. To those citizens, Ms. Hoheisel has become the most recent guilty party for their expressions of anger. To those who have written in recent days to insult Ms. Hoheisel, I ask you to stop blaming her. She is not responsible for the closing of schools nor is she responsible for the way recent elections have turned out. Because the board chose to consider alternatives to the status quo, district employees, including Ms. Hoheisel, have become targets. For that, on behalf of the board, I apologize. Top musicians from Stillwater Area High School performed at the Suburban East Conference Music Festival. The festival involves the top bands, choirs and orchestras from all nine of the schools that make up the SEC. During the day, the musicians are given the opportunity to perform for their peers and colleagues as well as for highly skilled clinicians to work with each group at the conclusion of their performance. Congrats to long-time coach Scott Christensen who was inducted into the Minnesota Track and Field Coaches Association Hall of Fame! Christensen's track teams have captured five state championships and racked up a total of 21 top-five finishes at state. 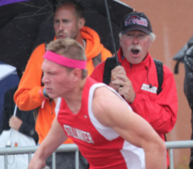 He has also guided the Ponies to three True Team state titles and finished among the top five 21 times. Read more. Did You Know? Our students across the district have access to more healthy and delicious condiments and toppings for school meals than ever before - including guacamole, pico de gallo, lettuce, tomatoes, onions and peppers. It's just part of our efforts to make our schools healthier places for kids, because we know kids who eat well learn better. Learn more about wellness in our schools at stillwaterschools.org/healthymoves. You can help make a difference! Remember to leave the sugary treats and candy-stuffed valentines at home this year. Instead, our staff will be providing fun and active ways for our kids to celebrate the season. Proceeds from the Partnership Party fund enrichment programs for students at all Stillwater Area Public Schools. Tickets are available at www.Party2017.gesture.com.